Patriots linebacker Tedy Bruschi was at the Garden for Game 5 of the Eastern Conference finals, seated with wife Heidi and teammate Vince Wilfork. The Celtics' mascot, Lucky, got Bruschi out of the crowd and had him hold a ball on a flip slam during a between-quarters break. 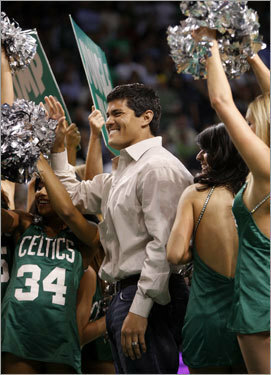 Bruschi got his signature last-name chant both coming and leaving the court.